Chris Lyddy is sworn in as police chief by First Selectman Mike Tetreau. FAIRFIELD — There is a new police chief in town. Chris Lyddy, a Fairfield native and Fairfield Prep 1978 graduate, was sworn in Jan. 15 at the Penfield Pavilion in a ceremony that drew dozens of friends, family members and town officials. Throughout his speech, Lyddy cited the department’s history and tradition while also alluding to the future. Lyddy joined the force back in 1982 and has moved up the ranks, serving as a patrol officer, detective, patrol sergeant, lieutenant and captain. Lyddy is also an active community member, serving on the Board of Directors of LifeBridge, CT Yankee Council, Boy Scouts of America and the Board of Directors of Operation Hope. The former police chief, Gary MacNamara, retired in October after serving more than 30 years on the force. He’s currently the director of public safety and government affairs at Sacred Heart University. As the former deputy chief steps up to his new role, other police officers move along the ladder, too. Five other police members rose up in the ranks, including now Deputy Chief Donald Smith, Capt. Christopher Tursi, Capt. Robert Kalamaras, Lt. Antonio Granata and Sgt. Christopher Mastronardi. 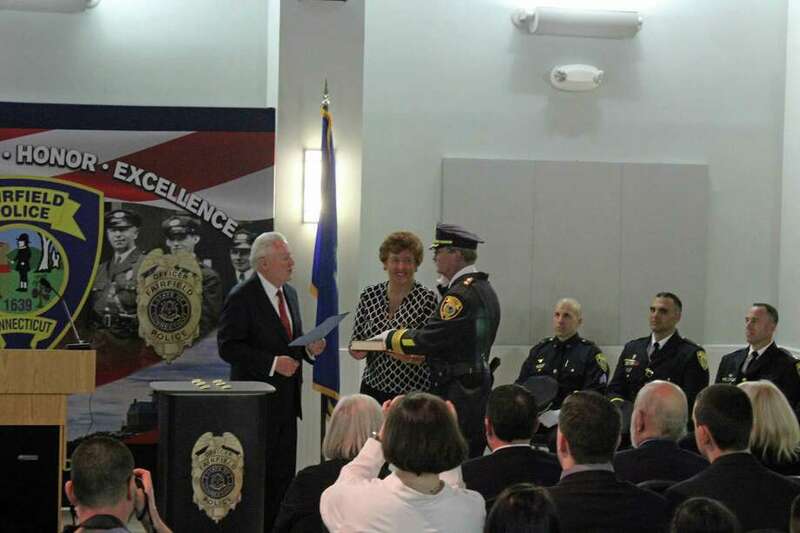 Town officials, former police chiefs and Fairfield’s state representatives and senator also attended the ceremony, thanking the Fairfield police for their service in the community.